The all-new PurgEye™ 100 Purge Monitors are the most advanced purge monitor of its kind from the makers of the best-selling MK V Purge Monitor. This new unit, like the earlier MK V models, is small, portable, easy to use and reliable. It will monitor O2 levels down to 0.01% (100 PPM) with a high degree of accuracy and comes complete with a stainless steel probe, 6 ft rubber tubing, aspirator bulb and carrying strap in a custom foam-lined case. It can be used in a continuous monitoring mode by connecting the tubing to an exhaust port of a purging device or enclosure and allowing the gas to flow freely over the sensor, or it can be used in a sampling mode by inserting the stainless steel probe into the area being purged or to an exhaust and using the aspirator bulb to initiate the flow across the sensor. The Argweld® product line has led the industry in cutting edge weld purging technology for over 30 years, and continues the tradition with the new PurgEye™ 100 Purge Monitors unit that offers even greater accuracy and unmatched features. 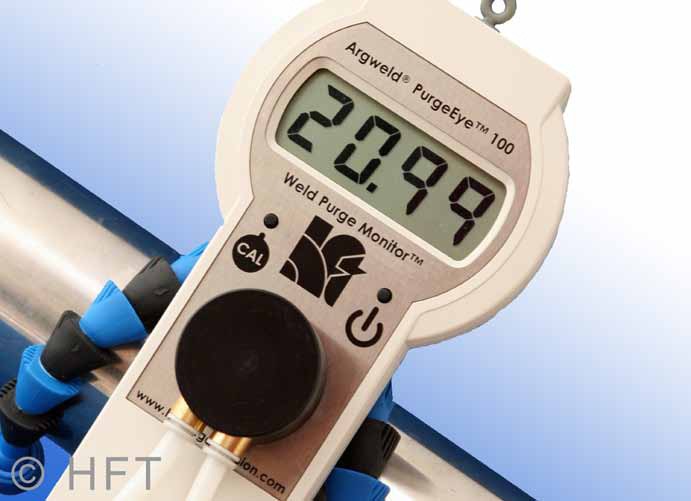 The Argweld® PurgEye™ 100 is specifically designed and built for welding applications to give accurate readings at the low O2 levels required for weld purging. In fact, the PurgEye™ 100 is significantly more accurate than any purge monitor of its kind. Don’t risk your welds with inferior purge monitors or O2 sensors and monitors designed for confined space or medical applications that are inaccurate at lower O2 levels. 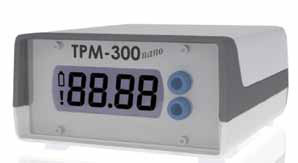 Weld Purge Monitor™ that reads from 1000 Parts per Million (PPM) down to 10 PPM for critical high purity weld applications that require very low O2 content such as titanium. Automatic alarms if O2 level exceeds pre-set limits. The “Nano” is a simplified version of the PurgEye® 300 offering all of the accuracy without all the bells and whistles. The PurgEye® 300 Nano is the industry’s most affordable Weld Purge Monitor® capable of accurately reading O2 levels down to 10 Parts Per Million (PPM). 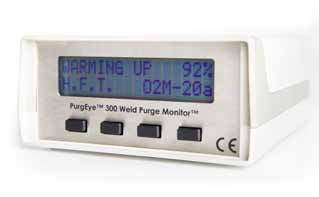 The PurgEye® 500 is a Parts Per Million Weld Purge Monitor® that reads from 1000 PPM down to 10 PPM with a built in pump for extracting purge samples for applications where a constant positive pressure flow may not be possible. The most advanced purge monitors available with revolutionary new technology! 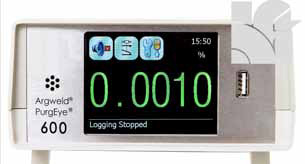 The world’s first Weld Purge Monitor™ capable of accurately reading O2 levels from ambient (20.94%) all the way down to 10 PPM.